Should a Cat’s Nose Always Be Wet? A healthy cat doesn’t always have a wet or a dry nose. The level of moisture on his nose isn’t an indicator of health; the texture of the nose is more important. Healthy cat noses can be dry or wet but if the skin looks unhealthy or abnormal consult your vet. Your cat’s cute little heart-shaped nose can go through varying degrees of moisture throughout one day. If he is reclining in a warm, sunny area his nose will be dry and warm. Quickly going from a warm area to a cooler area can cause moisture to develop. Indoor cats may often have dry noses due to living in a temperate environment. A slightly moist, cool nose is perfectly normal. 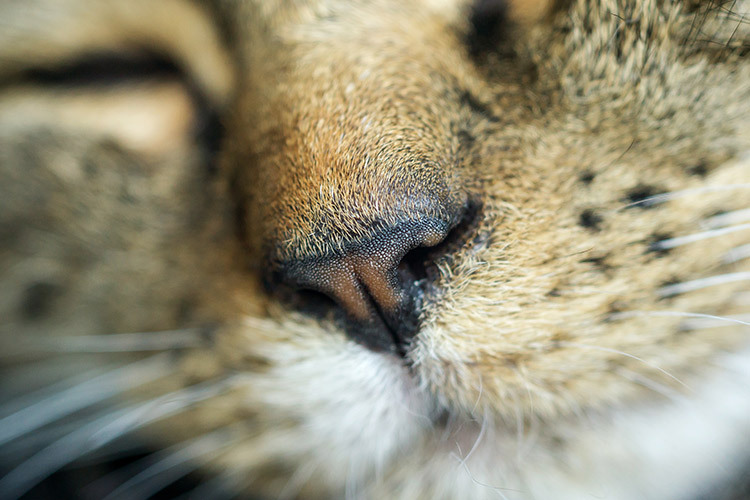 A cat’s nose has many functions and the moisture may aid in many of them. Cats can use their wet noses to help regulate their temperature. It is one of the many ways they use to cool themselves down as they don’t sweat except through their paws. Moisture also enhances their keen sense of smell. Cats can better smell the dissolved scent molecules. Wetness attracts the scent molecules making them stick to the nose and thereby allowing the cat to more effectively sample the scent. Cat’s noses stay moist for two main reasons – a steady supply of mucous and constant licking. When a cat naps he will wake up with a dry nose most likely from the absence of licking. If you notice that he has a dry nose don’t be alarmed as it is not an abnormal occurrence! When your cat is visibly dripping mucous or is having difficulty breathing because of a stuffy nose, it’s time to take him to the vet. Cats can catch a cold! If the stuffy, runny nose is accompanied by runny eyes it could indicate a bacterial infection or even worse – FIV/FELV. Keep other cats away from the sick cat as feline diseases can be highly contagious. Make sure each cat in the household has his own litter box and that their living quarters are separated. Just like many illnesses the cause of a severely runny nose might be hard to pinpoint. Your vet will need to perform tests to determine the exact cause. You’ll know the nose is too dry when the nose leather is unhealthy looking. A healthy cat nose is smooth and unblemished. When the skin becomes cracked it is time to seek a remedy. The dryness can worsen especially as the cat will continue to lick the affected area. The constant licking will cause further erosion of the nose leather resulting in scabs or bleeding. You may be able to simply purchase OTC products to heal the dry nose. Be sure to only purchase products made for cats because they will probably ingest the ointment. Some of the ointments are made for both dogs and cats which is perfectly fine. The best ointment to get is in a balm form. The thicker, waxier consistency will ensure that the balm stays on the nose and the greasiness will make it last longer when your cat tries to lick it off. Another way to combat dryness is to take a second look at the environment. Extremely dry, desert climates can affect pets just as much as it affects people. Is your cat in the sun all the time? A window will not filter out all the harmful effects of sunlight. Closing a blind or curtain can help keep the sun off your cat’s delicate nose. When in doubt consult your veterinarian. But before you must spend a lot of money keep in mind that a wet or dry nose is not a good enough indicator of health or sickness. Look at your cat’s overall health – how is his appetite, coat, skin, behavior? Lethargy, loss of appetite, and a dull coat are clear indicators that something is wrong. Can Cats Catch a Cold? When Can Puppies Start Taking Baths?